Confession: I have never hosted a Christmas dinner in my home. I have cooked a big portion of the meal and have transported it to another family member's house, but never have I had to deal with the bustling of extra company on the holiday. We always spend Christmas Eve at my mom's, and the day of at the in-laws, and somehow Christmas breakfast with the extended family kind of just became my job, passed along from my sister-in-law. That's usually done the week before the big day, so we'll be hosting that this weekend. Another confession: I actually like that I won't be dealing with the pressure of having company at my home Christmas day. After being dragged out of bed at unholy hours, watching my floor become littered with paper, ribbons and bows, then having to open toy packaging that I am sure Satan himself pieced together (seriously, have you ever tried to pry a Barbie out of the box without a minimum of 10 different tools to get the job done?) the idea of rushing to clean, cook, then look halfway presentable before company comes strolling in does not appeal to me. At all. So, I would like to take a minute to give a shout out to my mom and mother-in-law for hosting the holiday meal. Thank you for saving my sanity! Both dinners we'll be attending this year will be served with the traditional holiday ham. Since I am in charge of the main course for my mom's house, I wanted to do something a little less traditional this year and try using Golden Blossom Honey Mustard to add an extra kick of flavor to the meat. I did a test run of this Holiday Ham over the weekend, and it was a success! Simple, juicy, delicious. I also skipped out on traditional mashed potatoes and served it with steamed baby new potatoes. I did cheap out on prep and used some frozen dinner rolls to round out the meal, but hey, even weekend meal prep has its time limitations. What are you serving for Christmas dinner this year? Them potatoes look nom and crunchy indeed! I'll probably be eating dry pretzels and not much else at Christmas in my imperial chambers upstairs, as usual, avoiding the ebil feast downstairs. I think palm trees and sea breezes are in our Christmas futures. I am so sick of the snow and cold! I think a nice tropical Christmas will be fab-u-lous! haha yeah sometimes one toy takes longer to open than all of the presents. The packaging was all mangled when I got some open, stabbed them with a knife. Thankfully I have no hosting in my future, who needs that work? I think these toys should come with a set of wire snippers included. Makes one not want to buy the same kind of toys the next year after all that work! I hope you get to take some of the leftovers home to enjoy on Christmas Day! We go to my parents for Christmas dinner and they make turkey. This ham sounds better than that, though. NOM. I think turkey would be great on Christmas, Robin. We've done prime rib a lot as well. That looks so good. We have turkey every year, but we also have a ham. I'll have to give this a try. Everything's better with honey. I like that you switched it up and did whole potatoes instead of mashed. I love that idea! 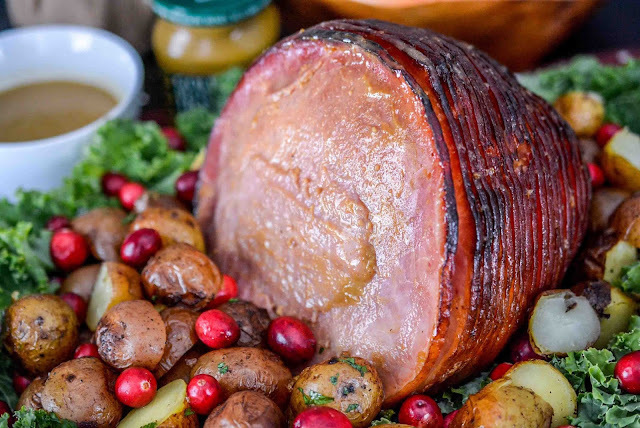 We always have ham for every Christmas dinner and this looks amazing! I have to have one! 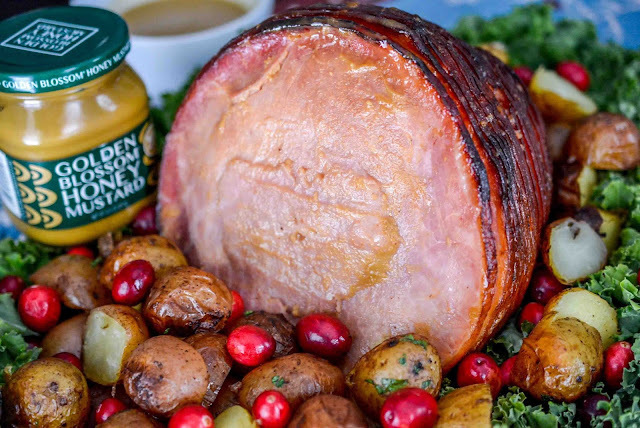 Honey mustard and ham is a classic combination. This sounds perfect for the holidays. My husband always had ham on Christmas (until he married me!). All of your recipes always look amazing! Our Christmas is not complete when ham is not on our table! That looks fantastic! That one looks fantastic! Ham is the center of our table for Christmas eve! Looking forward to having delicious ham this Christmas! I will try your recipe. I just love the combination of apple cider and honey! Yum. My sister-in-law is in your shoes regarding this hostess thing. I will share your valuable article with her. We're totally making ham this year too! Your recipe looks amazing!! We have different types of soups, shrimp, crackers, a veggie tray, holiday grapes and more for Christmas Eve and a hodge podge for Christmas day. Meaning everyone brings stuff.